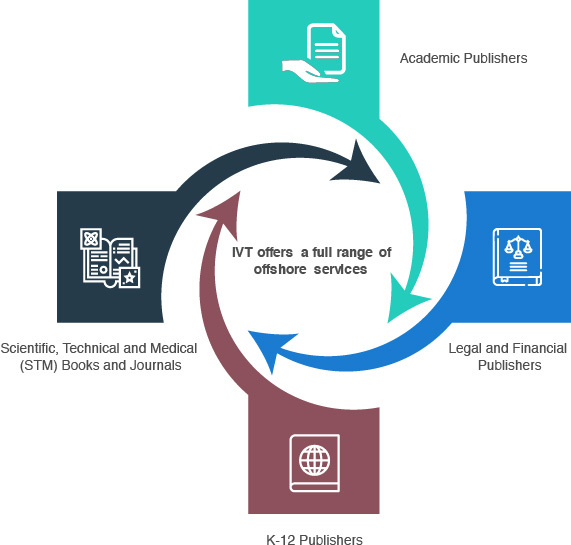 IVT is a publishing services company that addresses the needs of a publisher at every stage of a publication until final product reaches the market through electronic web media. We provide quality e-publishing services to publishers primarily dealing with publications in the field of marketing, professional, academic, trade, medical, legal, science, technical, scholarly, reference, college, etc. Our services are internationally recognized because of our strict integrated quality and quality control procedures that ensure services provided are on par with international standards. We have successfully achieved this through a powerful combination of experienced personnel and state of the art technology. Our team of very professional and enthusiastic experts, with over 12+ years of experience in the publishing industry, executes every stage in the e-publishing service carefully. We ensure constant growth of our employees by providing technical, behavioral, team building exercises and structured training programs that meet customer requirements. Currently, we are experienced in publishing multitude pages of the scientific books and journals every year. We are rapidly expanding our workforce to cater to the growing demands of our customers. Our service charges are unique and exclusive to every service rendered to each customer. Our services include that providing superior assistance in project management with facilitation given to the clients in each and every phase of the publishing process. It is noteworthy to mention that our standards of quality, time and cost are always exemplary. We have also diversified into parent, ancillary and e-text products across varying disciplines. Our highly talented, well-equipped team of professionals provides pivotal points of communication for every project. We believe in providing guidance and support at every stage of the production process and this conviction makes us work with editors and authors directly with maximum ease. IVT fling professionalism in its planning, designing, coordination and execution from the foremost point of contact like receipt and indenture from the customer to the final delivery of the solution. It’s a chain of events coordinating with the different teams working on the same project. Prompt delivery is our final motto. Manuscript tracking, copyediting, typesetting, proofreading, graphic designing, etc. all this is done in the given time frame with maximum ease at our concern.